Our family is a huge fan of Vietnamese food: the clean flavors, the fresh vegetables and herbs, and the silky and sweet Vietnamese-style iced coffee. When the Atrium Mall closed and took with it our favorite Vietnamese restaurant, there’s been a gap in our dining itineraries ever since. There certainly are some Vietnamese restaurants around, but, they’re pretty weak. I’ve driven all the way to Dorchester to get the real stuff, but, honestly, the drive is long and parking is a hassle. Thankfully and recently, Pho Viet’s II just opened, an answer to foodies’ prayers and vigilance. The wait is over, folks: Real and legit Vietnamese food is now in the Boston suburbs. Note that this is not a fly-by-night rookie shop for it is run by the same family that long has operated the beloved Super 88 Vietnamese food court stall in Allston. They know what they’re doing. I’ve been to the new spot a few times now and can say this: This restaurant is the real deal. The decor is simple with the attention focused, rightly so, on the food. The service is friendly and patient, and no matter how many people are in the queue or how many phone calls are coming in, the family remains serene and kind. You order at the counter, and they bring the food to you, piping hot from the kitchen which is just a few yards from where you’re sitting. Food is made-to-order, and so, there will be a wait, but, I assure you, it is worth your time. These good dishes cannot be rushed. If you’re new to Vietnamese food, I recommend one of their award-winning sandwiches (the bánh mì) or the vermicelli noodles (bún) with a grilled meat. Their spring rolls are killer, too. I usually go for the pho special, a large bowl of beef noodle soup loaded with slices of rare steak, well-done flank, tendon, meat ball, and tripe. The jiggly parts are the best. Add some slices of jalapeno, a squeeze of lime, and some bean sprouts and basil leaves for texture and taste. Then, top it all off with dollops of sweet hoisin sauce and Sriracha, and you are good to go, well on your way to flavor sensations that only a pho broth, simmered lovingly for eight hours (or more), can provide. And, when you’re riding out a Polar Vortex, why wouldn’t you order one? 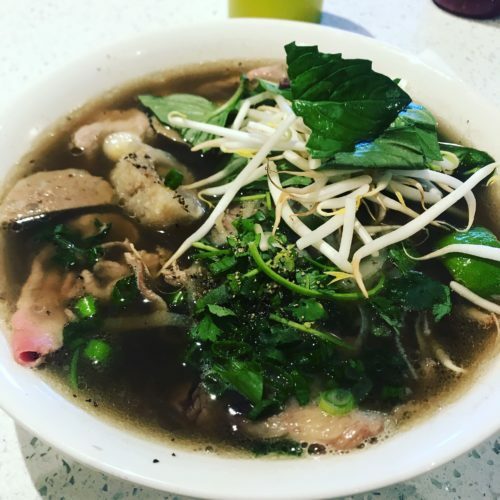 So, don’t pho-get, go to Pho Viet’s and enjoy a warm and warming meal. Pho was one of Anthony Bourdain’s favorite meals, and when I eat a bowl of it, I always remember him (prior post here) and both the legacy and interminable void he has left behind.